Windows 7 or above, 64-bit required. Quad-core computer with 8GB of RAM recommended. OS X 10.9 or above, 64-bit required. Quad-core computer with 8GB of RAM recommended. Voltage Modular does not currently work with Reason on Windows. Voltage Modular works with Cubase 10. To use Voltage Modular smoothly on previous versions of Cubase for Windows, you will need to turn off Multi-threading. See our forums for more details. 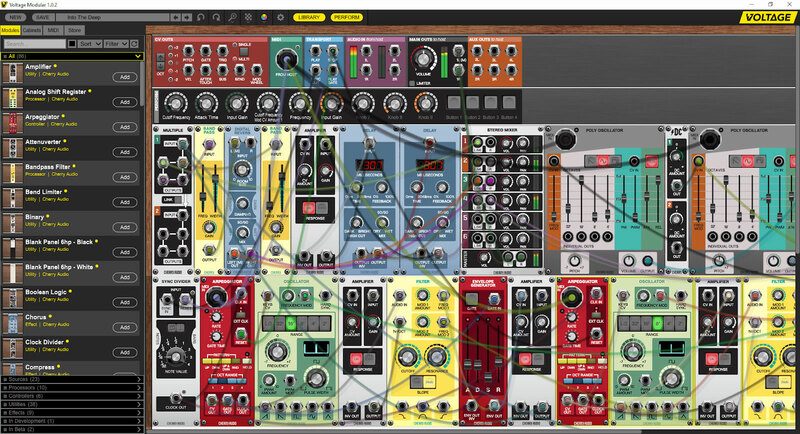 Voltage Modular is designed to be the best-sounding, most powerful, flexible, and easy to use virtual modular synthesizer available. 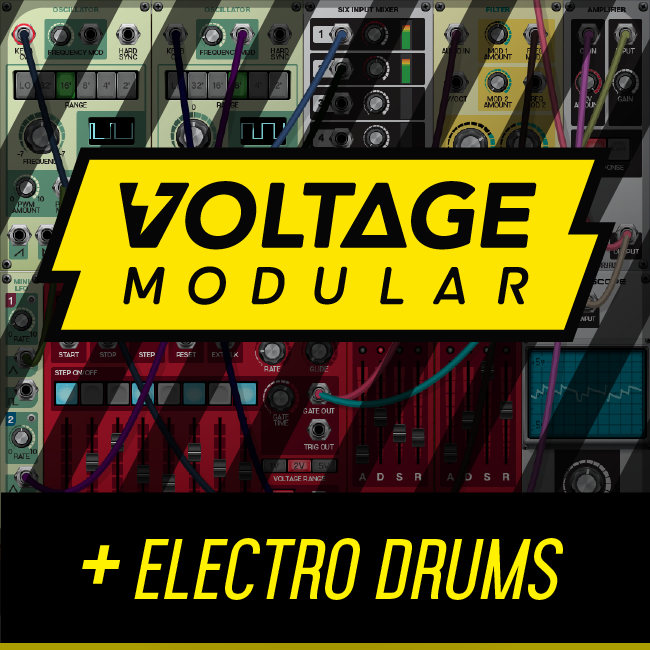 Voltage Modular is cross-platform for OS X and Windows, and supports AU, VST2, VST3, and Pro Tools AAX formats, as well as standalone operation. All plug-in formats can be used as both virtual instrument and effects plug-ins. User patches and cabinet files are freely cross-platform exchangeable. Unparalleled Workflow. Voltage Modular was designed from the ground up to address the shortcomings of other virtual modular synth instruments. Featuring six-way pop-up mults on all inputs and outputs, easy repositioning of modules or groups of modules, cables that can be moved and rerouted at all times, and control panels designed to be easy-to-read and operate with extensive visual feedback, including cable signal flow indicators, Voltage Modular offers a clean, polished, virtual modular interface like no other. Fantastic Sound Quality. All audio processing in Voltage Modular uses high-quality 64-bit double precision math and all module processes are zero-latency and operate on individual samples for true modular performance. This translates to fantastic sounding audio-rate frequency and amplitude modulation, oscillator sync, insane delay feedback, and more. Vast Array of Modules. In addition to "industry-standard" oscillator, filter, envelope generator, voltage-controlled amplifier, and utility modules, the Voltage Modular Core package features innovative modules for expanded creativity, including a polyphonic oscillator with fast and easy MIDI setup, CV and MIDI in and out modules for easy interfacing with other virtual instruments and external hardware synthesizers, the Formula module, which applies a wide array of mathematical equations to audio and control signals, and much more. The Misfit Audio Electro Drums package contains features 14 classic analog drum and percussion modules as well as a dedicated sequencer, combining to create a powerful and easy to program, self-contained vintage drum machine. Infinite Expandability. The innovative module browser allows users to purchase and automatically install modules and sound presets directly from within Voltage Modular for immediate expandability. The number of modules and cabinets contained in a patch is limited only by computer CPU performance. Developer Friendly. Our exclusive Module Designer application lets software developers design and program custom modules with virtually no functionality limitations. Completed modules can be submitted to the Voltage Module Store, allowing programmers to sell approved modules directly to Voltage Modular users. Voltage Modular is far more than just a musical instrument; it's a complete and infinitely expandable modular platform. Third-party developers can build new modules, performing almost any audio, MIDI, or signal processing function. Module development is lightning fast, and all modules are inherently cross-platform. To learn more about Voltage Modular, listen to audio demos, download a trial, or make a purchase, please visit cherryaudio.com or contact info@cherryaudio.com. Easily the best modular synth plugin by a wide margin. Voltage module development is happening A LOT faster than its competitors. The interface is a better and more intuitive by a landslide (yes, you can drag modules between other modules, and they'll make room like you'd expect; Softube's doesn't do that, which is quite frustrating). The features that have been added to Voltage since its launch are staggering. Voltage can also host other plugins with an impressive level of integration in regard to both audio and modulation. Turn every other synth plugin you own into a powerful module without leaving Voltage or your DAW. Voltage also offers a friendly interface for developing your own modules, which is a great way to learn Java while you're at it. I cannot say enough great things about Voltage. It's a synth head's dream.